The community on our forum are a great group of people that share Android Devices as a common interest, and the use we put it through every day. Some of us have extended knowledge and experience with computers and Android systems in general and we're all here to help to the best of our ability. This forum is all about Members Helping Members. Before you start posting, please read these Guidelines. If there is anything that is unclear, or if you're in doubt please feel free to contact one of the Moderating team here at GalaxyTabforums.net. Please Note: This is a privately owned forum. We, The Owners and the Moderating Team, reserve the right to accept or decline your membership application, so you are not guaranteed membership and your membership is subject to revocation. We reserve the right to declare what is suitable and what is not on GalaxyTabforums.net. Advisory: All posts on GalaxyTabforums.net are to be in the English Language. This is a Family Friendly Forum. Don’t post content that you would not want your children, mothers or wives to see. * No Discussions on Religion will be allowed either. Please take them to an approriate forum too. 2. You will not violate a persons privacy by publishing information without permission that is private and personal. If you feel the need to do this, send one of our moderators a message before doing so. Please remember The Golden Rule: Treat others as you wish to be treated! 4. Create threads in the proper forum. Threads created in the wrong forum are subject to deletion. One thread posted in multiple forums(Cross Posting) is subject to deletion and issuance of Infractions. 5. We have a zero-tolerance approach on SPAM. If you post spam, you risk your account being permanently banned and your topic will be deleted. 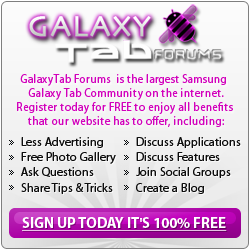 No advertising is allowed on GalaxyTabforums.net without prior approval by the ADMINs. 7. Do not promote your websites, domains, company, or services in any of the discussion forums. This includes starting a thread, replying to a post, or putting it in your signature. If a member is seeking assistance or looking for a certain type of product, the best way to offer your services is to send a PM. The only way people are allowed to advertise on this site is of they are paying to do so. Please contact the ADMINs if you wish to become a Supporting Vendor. 8. Promoting other Android related forums in your posts, signatures, or in any way on the forum is not permitted. Unless an agreement has been reached with the ADMINs of GalaxyTabforums.net. Doing so without this will result in infractions being issued and or banning. EXCEPTION: You are permitted to place links to personal blogs, facebook, twitter, G+. 9. No charity/fundraising posts will be allowed without prior Authorization of the ADMINs . The Asking or Suggestion of making Donations by any member without prior authorization of the ADMINs is not allowed. 10. Users may disagree with the decisions or actions of the moderators and/or administrators, however, disagreements, criticism and the like are not to be aired within the forums. Please feel free to PM the person directly rather than air your dirty laundry in public. 11. Any abuse towards our staff and/or management will result in immediate suspension of your account. * The maximum number of lines in a signature is 5. * No external links as indicated above should be posted in your signature - exception is of course the links to personal blogs, facebook, twitter, G+. * Dev/Themer Support is allowed within reason. To be determined by the Moderation Staff. * Do not put any kind of advertisements in signatures. * Signature text should comply with our regular posting Guidelines. * If your signature is in violation of any of these new rules, the Staff may remove it without prior notice. 13. DO NOT advertise anything that costs money. Offering Items or Services to Trade, are not allowed. Anyone trying to use GalaxyTabforums.net to advertise any item for sale will be issued infractions and or banned, and their posts will be deleted. GalaxyTabforums.net is not Ebay or Craigslist. 15. Warez, Paid Apps for free, Paid Apps included in ROMs, the Sharing of Paid Apps is not allowed on GalaxyTabforums.net. Warnings, Infractions or Banning May Result at the Moderator's Discretion. Except for Spammers, We will make every effort to notify you if you are not following the forum’s Guidelines. Moderators and Administrators have the final word. If you have a problem or a complaint please direct it to the ADMINs instead of posting in the public forums. They will quickly take the appropriate actions to resolve the issue in a private and discreet manner. Have fun and enjoy the forums! I'd also add this seems to be turning into an international and not everyone posting here uses American English as their primary language. Please be respectful and forgiving with posts that might have hard to understand spelling and/or wording. If there are just some slight errors, let it go. If you cannot understand what the poster is saying please be kind when asking for elaboration. ComputerGranny and closetflange334 like this.